Here’s another pasta and potato dish that suits the summer. No claims to originality here. This combination of ingredients can be found, I’m sure, in many other recipes. But, then again, how many combinations of basic refrigerator staples can there be? I open the door of the fridge, see a cauliflower that demands to be consumed before it grows mold, some pancetta or guanciale in the same condition, and a few fingerling pototoes in the straw larder. My options are limited, but fortunately I love the effect of combining these elements. 2. Cut either a small whole cauliflower or half a medium-sized one into florets. Then halve or quarter them. Put the cauliflower pieces in a bowl. Pour in a slug of olive oil and stir to coat the pieces. Add salt and pepper. Line a baking sheet with aluminum foil. Spread the cauliflower around the baking sheet. Don’t crowd the pieces. Put in oven and roast for 15-20 minutes, or until the edges of the cauliflower turn brown and caramelized. 2. Put on a pot of well-salted water to boil. 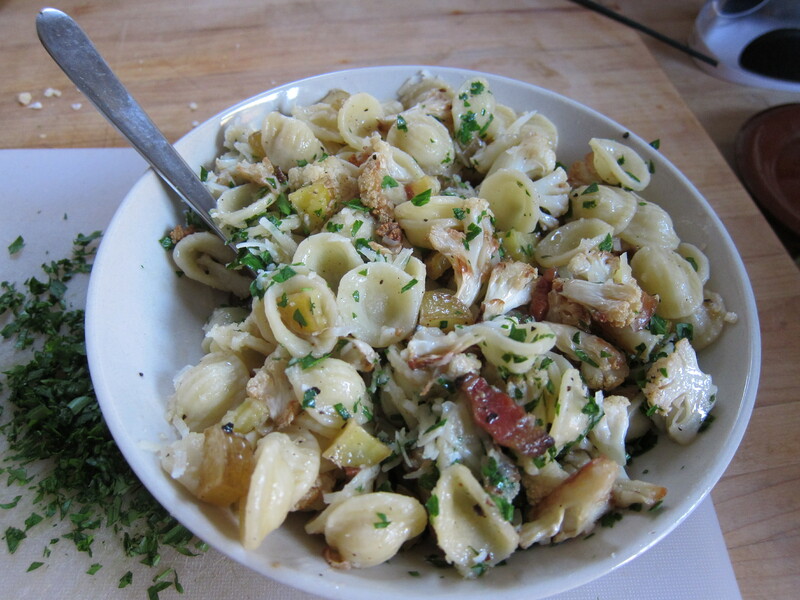 Measure 3 1/2 oz of orecchiette pasta and set aside. 3. Meanwhile, mince a big clove of garlic. Dice 1 or 2 oz pancetta, a strip of bacon, or guanciale. Cut into small cubes about 4 fingerling potatoes. Scrap the kernels off one ear of corn and set aside. 4. Sauté the garlic in a bit of oil in a medium sized skillet. Add the pancetta or bacon and stir so that the garlic doesn’t turn golden. After a few minutes, add the potato cubes and corn and continue sauteing. 5. When the cauliflower is done, scrap the pieces off the foil into the skillet. 6. Add 3 1/2 oz. orecchiette to the boiling water and cook for the recommended time minus 2 minutes. Scoop out the pasta with a slotted spoon or spider and dump the wet pasta right into the skillet. Turn up the flame. Add a touch of pasta water (not too much) — just to provide moisture to keep the pasta cooking. Attend closely, let the water evaporate, season as necessary. 7. Meanwhile, chop the parsley and cut 1 oz parmesan cheese to have it ready to grate at the end. 8. When the pasta has reached the degree of firmness you like and the water has almost entirely evaporated, tip the contents of the skillet into a pasta bowl, scatter parsley over it, and grate the cheese.